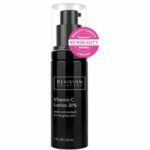 Vitamin C Lotion 30% a daily antioxidant for brighter skin with THD Ascorbate. Vitamin C Lotion 30% is formulated with the most advanced form of Vitamin C for healthy, radiant skin. The 30% formula contains one of the strongest concentrations of Vitamin C available. Contains THD Ascorbate, a highly stabilized, very powerful form of Vitamin C.
Brightens dull skin.Provides a full line-up of antioxidants, including Vitamin E and Coenzyme Q10. Moisturizes and conditions skin with Squalane.